It's been over two years in the making, but I'm finally releasing the ebook version of my cookbook. The Ungourmet Vegetarian ebook is a concise but comprehensive guide to cooking delicious and affordable food, with over 30 recipes from the world’s vegetarian traditions to get you started. 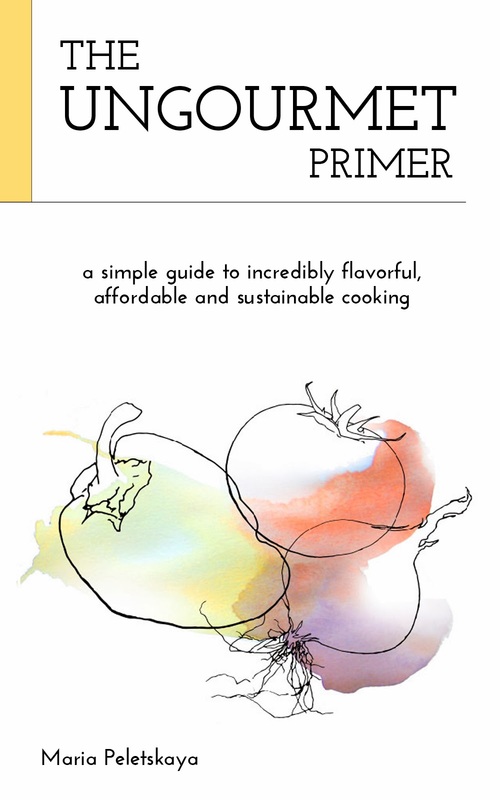 An expanded print copy, featuring 100+ recipes, will be available through Amazon this summer. I would love to get this book in the hands of as many readers as possible, so for the next little while I'm giving away FREE copies. Any and all comments are greatly appreciated. I love delicious food, but I also love having more breathing space in my life, including more time, fewer expenses, and fewer worries. The first motivation for writing this cookbook was to help dispel a myth that healthy meatless cooking is somehow less simple, less affordable, less satisfying or exciting. The second came from the frustrating discovery that the vast majority of recipes in published cookbooks, even those claiming to focus on “everyday” cookery, are actually prohibitively elaborate or pricey entertainment food. Some of these are quite pretty and tasty, but just not the truly practical home cooking that’s easy, delicious and healthy enough to make all the time. The final motivation was to add to the growing body of attractive (rather than Spartan) alternatives to the ecologically and medically ruinous meat-based cuisine that is currently the norm in the developed world. Plants, quite simply, are the foods that do us the most good and our planet the least harm; I would like to celebrate this heartening fact by sharing with you a collection of easy, delicious, plant-based recipes from around the world. My goal was to gather in one place time-tested, i.e. traditional, vibrantly flavorful dishes that would be easy and inexpensive to prepare in a western kitchen, even for a complete beginner. Why is there a predominance of Asian and Indian recipes? Simply because those cuisines are exceptionally delicious and embody millennia of vegetarian experience. Many of the mysterious and mouthwatering ethnic dishes that we rely on restaurants to make are actually quite simple to make at home, and in a healthier, more authentic way at that. I hope you will be pleasantly surprised to discover, as I did, that cooking in these traditions, using whole ingredients, is totally accessible and immensely rewarding. The introductory chapters of this book will help demystify spices, unfamiliar ingredients, cooking techniques, and shopping. In a sustainable diet (diet come from the Greek, dieta or “way of life”), humans are part of the ecosystem; how we best function within that ecosystem is determined in part by our diet. It is no random, happy coincidence that the very foods that promote our health are also the most environmentally friendly to grow. And it is no coincidence that consuming the most energy-intensive factory-farmed meat or processed foods undermines our bodies while depleting and polluting the ecosystem. Most of us really do care about our own and our family’s health, being kind to the environment, and not wasting money and resources, but somehow we get caught up with other thoughts and responsibilities. We forget to be mindful of those things that we care about. Or we’re tired and let habits take us to something that seems instantly gratifying, even though we don’t feel good about it deep down. If you’re reading this book you’ve already decided that food, because of its immensely powerful effects on our health and the environment, is too important to continue feeling uneasy about. The good news is that with just a bit of care, you can transform that uneasiness into feeling good about what you eat literally overnight. Finally, I want to clarify that while I truly believe in slowing down enough to connect to our food, environment, companions and ourselves, this is not a foodie or epicurean book for the elite few. 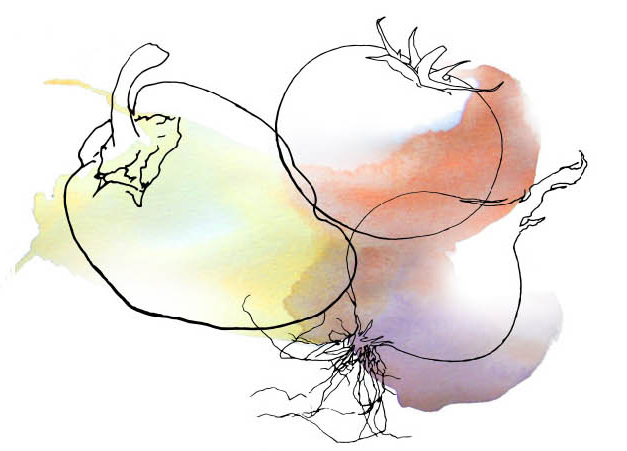 Rather my hope is to bridge the ethos of the slow and simplicity movements (cooking delectable traditional foods from scratch, connecting with others, minimizing waste and clutter) with the everyday needs and constraints of “the 99%”. To continue reading, get your FREE copy today.